Viewers weren’t roused by arrivals or finales. CBS: UNDERCOVER BOSS: CELEBRITY EDITION premiered at 0.6, down 0.3 from the May 2017 celebrity edition of its parent show. HAWAII 5-0 and the season finale of BLUE BLOODS were both up 0.1 to 0.8, which for BLUE BLOODS was down 0.2 from the 2017 finale. CW: The season finale of the already-renewed DYNASTY and the night’s episode of the already-canceled LIFE SENTENCE both held at 0.1. 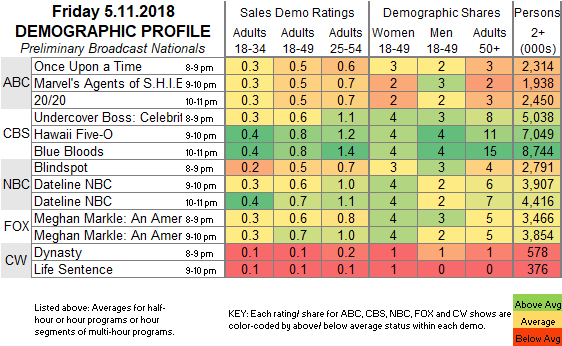 ABC: ONCE UPON A TIME, AGENTS OF SHIELD and 20/20 were all up 0.1 to 0.5. NBC: The just-renewed BLINDSPOT stayed at 0.5, and DATELINE was steady at 0.7. FOX: A MEGHAN MARKLE: AN AMERICAN PRINCESS special was at 0.7, the same as last week’s MASTERCHEF JR.
Tonight Showtime enters Saturday original programming with the miniseries PATRICK MELROSE, and SNL is hosted by Amy Schumer, with musical guest Kacey Musgraves. On Sunday, NBC has the season or series (?) finale of TIMELESS, and HBO airs season finales of SILICON VALLEY and BARRY.